We grow more than 30 varieties of Certified Organic Herbs on our farm. We also grow certified organic vegetables available at our farm store. Please contact us for more information. For FRESH herbs, please click on the product for pricing. Fresh herb orders must be placed via phone or email, please contact us to place your order. We are now taking pre-orders for the 2019 growing season. Please note we have a 10 lb. minimum requirement per species for fresh ice-packed herbs due to the amount of work required to process, pack, and ship each order. 15% off orders over 20lbs. 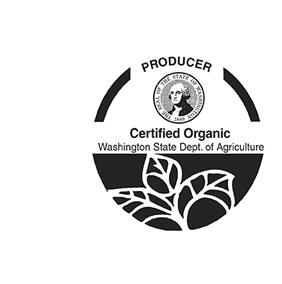 We are a Certified Organic Producer through the WA State Dept of Agriculture. WE ARE NOW TAKING PREORDERS FOR THE 2019 GROWING SEASON. Mix and match herbs! If you order 10 lbs of catnip, 5 lb of peppermint, 3 lb of lemon balm, and 2 lb of yarrow for a total of 20 lbs, you will qualify for the bulk discount. If mixing and matching, please call or email your order.